A POLICE drugs unit was left puzzled after swooping on a gang smuggling cannabis from Spain to the Netherlands. 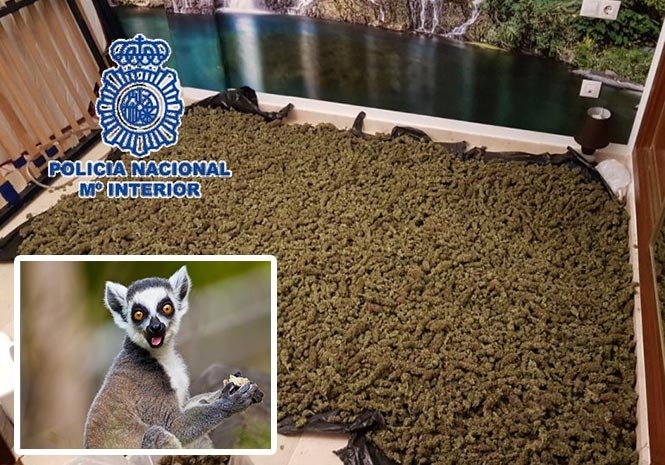 Raids on properties in Malaga and Cordoba saw investigators seize more than 100 kilos of marijuana and hashish, plus a ring-tailed lemur. The endangered primate – native to Madagascar – was reportedly living in the Benalmadena home of a group of Dutch individuals who bought the drugs from Spanish traffickers in Cordoba before shipping them to their homeland. A probe launched last October led detectives to the ringleaders, with three men aged 19 to 35 remanded in custody. Vehicles and mobile phones were recovered during searches on the culprits’ homes, while the lemur has been passed to SEPRONA, the Guardia Civil’s wildlife crime unit.